MASSIVE BERLIN-BASED public transport operator BVG has ordered 15 more zero-emission, 12-metre electric Solaris Urbino low-floor city buses - crowned 2017’s (European) Bus of the Year - bringing the city’s EV total from the innovative Polish bus brand to 20, it’s reported recently. Berlin's BVG has just ordered 15 more electric buses from Poland's Solaris. The new vehicles will arrive in the German capital in 2019, Solaris Bus & Coach confirms. There are already five Solaris electric buses in operation on the streets of Berlin and the new order will bring that total to 20 zero-emissions vehicles with the ‘green dachshund logo’. According to the Poland-based company, the battery buses for Berlin will be powered by axles with integrated traction motors. The energy will be stored in a set of Solaris High Energy-type batteries with a total capacity of 240kWh, and these will be recharged via a plug-in socket - the standard solution for Solaris electric buses. The Berlin buses will feature passenger compartment air conditioning and double-USB sockets for charging mobile devices while traveling at the passenger’s convenience. In terms of capacity, it can accommodate a maximum of 65 passengers, 28 of them seated. Eight seats will be available from the low floor, making it easier for people with reduced mobility to take their seats, it’s stated. 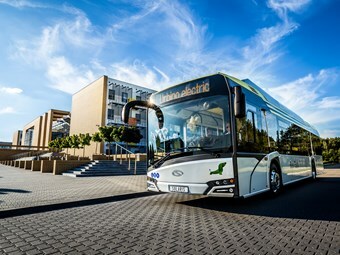 There are presently 27 Solaris electric buses in total operating on the streets of German cities, including Brunswick, Hannover, Hamburg, Frankfurt, and Dresden. The increased order comes at a time that Solaris announced its new remote diagnostic option for all new and existing electric buses. That is, the engineers from the R&D department of Solaris Bus & Coach created a system to streamline and support diagnostic solutions, improve maintenance options, and to facilitate the analysis of specialist data derived from its vehicles. Vehicles fitted with the remote diagnostic system called eSConnect will enable the establishment of a database of real performance information that will make it possible to perfect solutions applied by the manufacturer, it’s claimed. Created for the purpose of supporting maintenance, the eSConnect system may be installed in every electric vehicle made by Solaris, including those already delivered. In fact, says Solaris, some of these [operators] have already decided to apply the pilot scheme to their fleets. "Most importantly, though, the remote eSConnect system gives customers the opportunity to work with basic information that allows [them] to optimise fleet usage," the company states. It will also enable the Polish bus producer to further refine its vehicle designs, which have already garnered the firm a major award: city Bus of the Year 2017. Solaris says the data collected will include, among other things, information on the bus fleet position in terms of time and location; updated battery status; the mileage covered by any given bus in a given time; plus energy use or even notifications about all batteries being fully charged. The eSConnect will help in the remote identification of potential errors notified by the vehicle on the driver’s panel, plus the monitoring of operating parameters of the system and the generation of statistics - for instance, the number of charging cycles and the time needed to recharge batteries, it’s stated. The Solaris eSConnect system entails quite a few advantages for its customers, the company believes. For the buyers, the system means a better use of the vehicle fleet and a confirmation of a bus being properly managed by the drivers. It also gives clients the possibility to collect and analyse data that simplifies a precise identification of technical requirement for buses serving on particular routes, Solaris says. Solaris Bus & Coach is a major European producer of city, intercity and special-purpose buses as well as low-floor trams, the company states. Since the start of production in 1996, more than 16,000 vehicles have already left the factory in Bolechowo, Poland. Solaris buses are running in 32 countries. Despite its young age, Solaris has become one of the trendsetting companies in its industry, it states. For many years it has been the indisputable leader among the suppliers of city buses in Poland, as well as one of the largest suppliers of city buses in Germany, it adds. As Germany’s largest local public transport company, it has some 14,600 employees that "ensure … Berliners and their guests are kept moving". BVG users can choose from a wide range of services including underground trains, buses, trams and ferries, it states. BVG have been synonymous with reliable transport services in the German capital since 1929, the company says.